Ever watch the TV Show “Chuck”? A visitor to the site asked for this portrait of the tv star Zachary Levi Caricature (Secret Agent Chuck Bartowski). He started the show real nerdy and I did a few pencils of that. But since the show started he’s filled out a bit, prolly due to Producer pressure or the rigors of the job. Anyhow, here you are. This illustration is a caricature and a portrait, but really more realistic than a caricature ought to be. But that’s the magic of cartooning…it doesn’t matter. Drew it up in Adobe Illustrator and added a tiny detail in Photoshop. Total time about 40 Minutes. 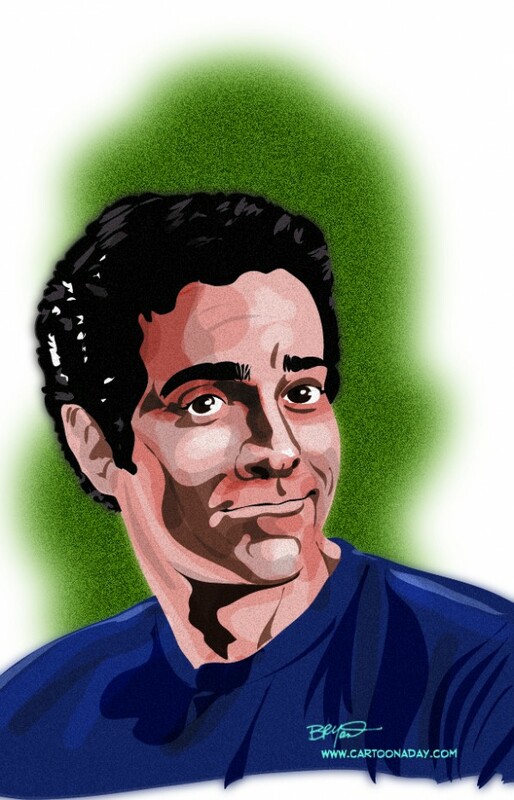 Inspiration: Inspired by a visitor assignment to draw a portrait caricature of Chuck Bartowski. Process: Sraight Adobe Illustrator with Wacom Cintiq and Photoshop filter for finish.